Christmas Time (Don’t Let the Bells End) is a festive EP by The Darkness in 2003 as a bid to grab the Christmas number 1 spot in the UK but landed second after losing out to the joyless Mad World by Gary Jules and Michael Andrews. The single was then featured as a bonus track on the rerelease of their debut album Permission to Land. 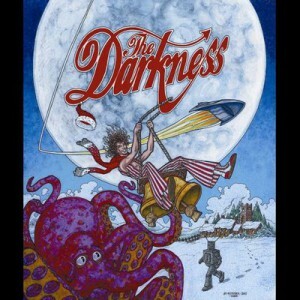 Both songs are rife with the same cheeky humour found on their debut album and since there are only 2 short songs on this EP, The Darkness manages make it more obvious than ever on Christmas Time (Don’t Let the Bells End) by letting the double entendres loose to sing about “bells end” “ringing in peace” during the festive season. The song also features a children’s choir and ends with bells and chimes to give it that authentic Christmas feeling while referencing the title in a musical context this time. Justin Hawkins maintains his falsetto range and somehow restrains himself from his own flamboyant wailing only to let loose in a desperate plea to grab some attention from the choir when his own voice is buried by them on Christmas Time (Don’t Let the Bells End). I Love You 5 Times is a power ballad that is highlighted by its ridiculous lyrics in which Justin Hawkins confesses that “I watch as you spend an hour or two in the bath like a tuna” and “twice a week I take a peek as you bathe like a reptile”. If this wasn’t enough for you he purrs, moans along to the choppy guitar solo and ends the song with a kiss. The lyrics pull the ballad together and wouldn’t be the same without them whereas Christmas Time (Don’t Let the Bells End) is thoroughly enjoyable even if you are completely oblivious to the humour. The Darkness put a brilliant, cheeky twist on Christmas cheer by bringing a duo of genuinely jovial songs to the table instead of rehashing tired Christmas classics like countless others have done before.